When Sarah Swift begins a new project, she starts with a loom. But the materials she weaves into that loom could be anything: wool, silk, rubber, and twisted plastic bags. 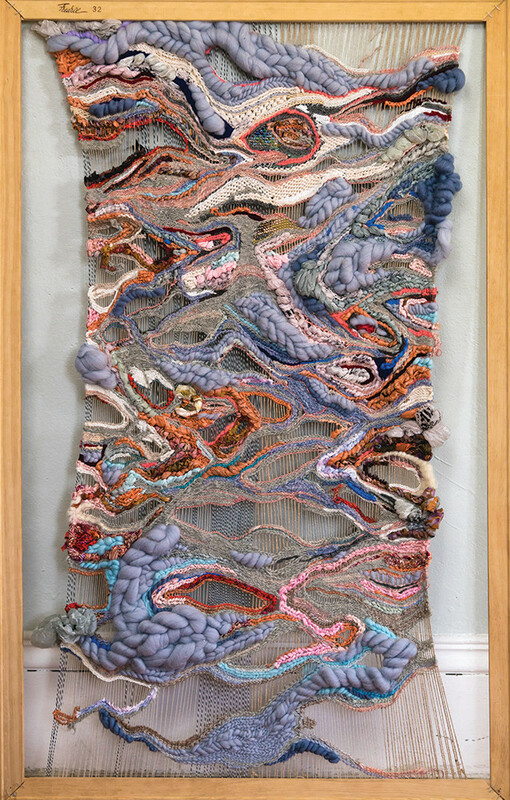 The compositions come together as tapestries of found fibers, dreamlike collisions of color. During the day, Swift is the director of Hera Gallery in Wakefield, where she schedules programming and helps curate shows. Then she retires to her apartment, where her living room doubles as a studio. After years of developing her abstract style, Swift is reaching a broad new audience: she’s scheduled to show her work in four different shows by the end of 2018. Her solo show, “FLUX: Cycles of Change,” just closed at Hera Gallery. Swift grew up in Exeter, the child of marine biologists, and she yearned for urban culture. She went to the Pratt Institute in New York City to study painting, and she stayed in the city for seven years. She presented her work at some group shows, but the competition was cutthroat. To clear her head, Swift backpacked alone in Europe for three months. After touring museums in 13 countries, she felt rejuvenated and returned to Rhode Island. But before she could make her next move, she learned that Hera Gallery was looking for a new director. Swift started volunteering, made her interest known, and was eventually hired. The directorship is full of responsibility, a tall task for any 25-year-old. But Swift loves her new role, and working with artists all day has only heightened her enthusiasm for her own projects, particularly the weaving.